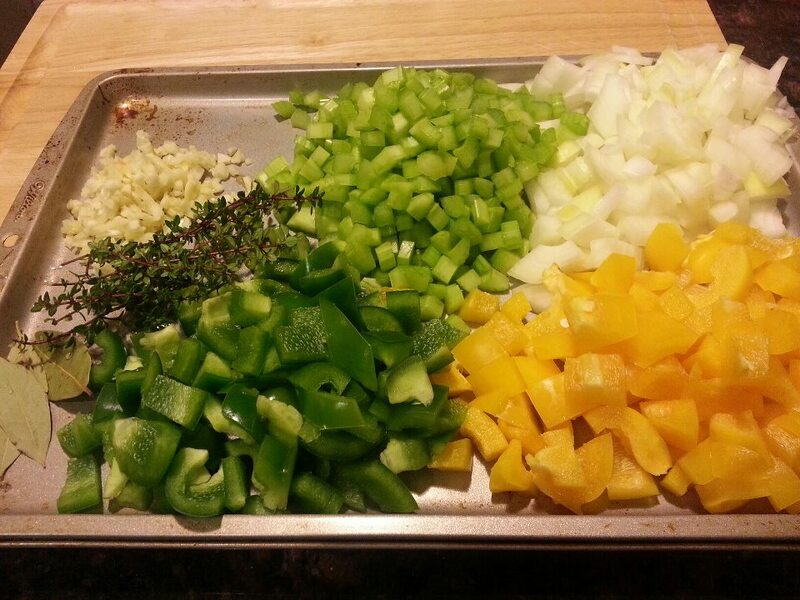 Anyway , from what i heard , gumbo most important ingredients are 3 items , they call it holy trinity , Onion , Bell Pepper and Celery . They didn’t include garlic , i wonder why ? But in all gumbo recipes you will always find those 3 ingredients that is a must . This recipe does call for garlic , with 2 other herbs included . Sprinkle salt and pepper , along with cayenne pepper and smoked paprika all over the chicken thighs and drumsticks , rub with your hands all over the chicken . Heat up a dutch oven with little olive oil , brown the chicken and sausage and bacon , for about 5 minutes on each side . If you don’t have enough room , do it in couple batches . Remove the browned meats from the pot , set aside . And the browned meats , the sausages , bacon and thighs and also drumsticks . Bring to boil , and the turn the heat to low , simmer for 45 minutes . 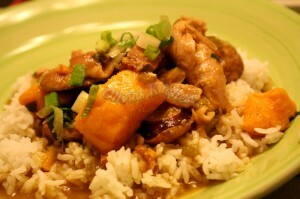 After 45 minutes , the meat should be falling apart , the sweet potato will help thicken the gumbo . Take the chicken out , and debone them , return them back to the pot . Sprinkle with fresh parsley and serve over warm rice with green onion garnish , if you prefer a hotter , spicier gumbo , chop some bird eye’s chilis , it will turn out superb !!! Total time cooking and preparation is about roughly 1,5-2 hours .